The Dodgers hosted several events and collaborated with Major League Baseball to commemorate Jackie Robinson Day. 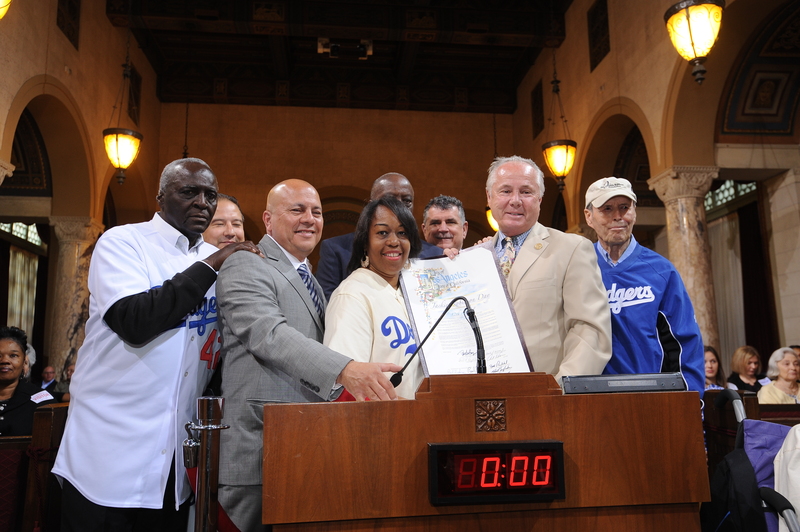 April 12 – LA City Council presented an official proclamation to Dodger Alumni “Sweet” Lou Johnson and Tommy Davis. Also in attendance were Jackie’s niece Kathy Robinson Young adn her daughter Brittni Hamilton. Other local leaders taking part in the ceremony were Councilmembers Ed P. Reyes adn Dennis Zine, General Manager of City of LA Recreation & Parks Jon Kirk Mukri and former Major Leaguer John Young.